Download "Increase Outside Sales Productivity using Mobile Technologies"
1 White Paper Sponsored by Epicor Software Increase Outside Sales Productivity using Mobile Technologies For most lumber and building materials (LBM) dealers and distributors, their outside sales people are critical to the success of their company. As the company s eyes and ears on jobsites, outside sales people often find opportunities and foster the company s relationships with key contractors and builders, architects and other construction supply companies. Yet, outside sales people haven t been given much more than a phone and a pad of paper with which to do this critical job. Ill-equipped and without access to the business management systems running at the branch office, outside sales people can sometimes be little more than a go-between. Epicor BisTrack Cloud mobile LBM sales software works on smartphones, tablets, and touch-screen laptops, making it easier and faster for an outside sales person to nurture prospects in their pipelines, get answers for customers, and to place orders wherever they are. Yankee Group reports 26% increased win rate using mobile enterprise technology. 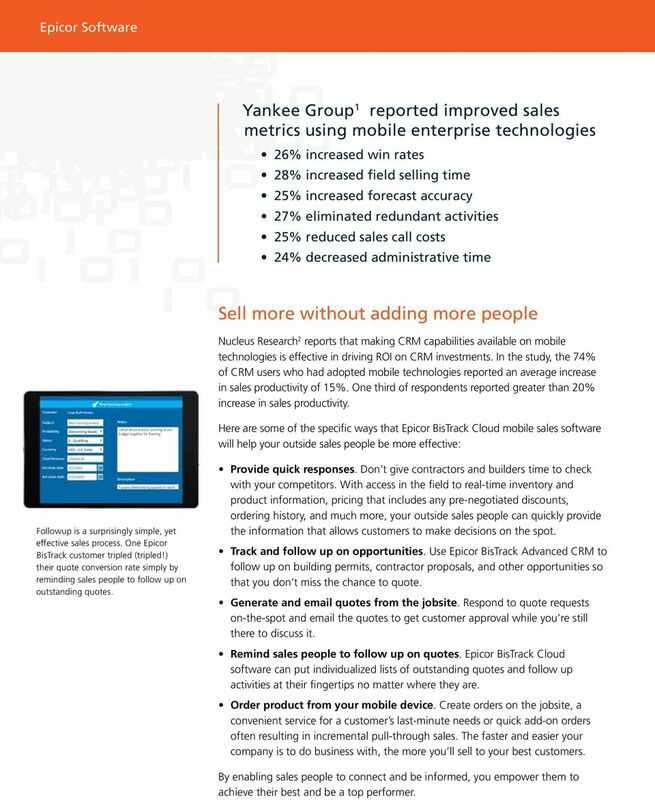 The Yankee Group findings on page 3 confirm that mobile and cloud technologies can play a significant role in improving sales performance, especially when mobile technologies are tied into your business systems CRM, inventory management, accounting, and transaction processing. 2 Turn go-betweens into top sales people The Epicor LBM team wants to help you eradicate responses such as, Let me call in and find out, or I ll get you the answer when I m back in the office. Those represent missed opportunities, lost sales, and disappointed customers. Our goal is to arm your outside sales people with all the information and tools they need to respond faster and close more orders right there in the field while talking to builders and contractors. For years, Epicor business management systems have helped increase productivity in the back office. Now, Epicor BisTrack Cloud software connects outside sales personnel and managers with the sales tools, CRM technologies, and comprehensive LBM business management system they need to improve sales performance. 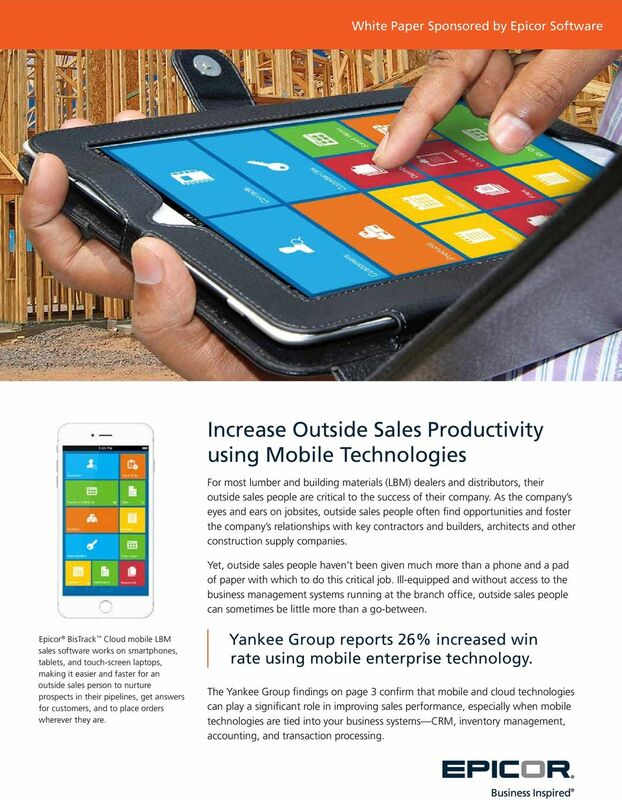 Mobilize for higher sales productivity But what do we mean by mobile and cloud sales technologies? Well, it s more than storing contacts on your mobile device or documents in the cloud. Epicor BisTrack Cloud software gives our sales team instant access to key information in the field that sets them apart from our competitors, and helps us offer our customers an enhanced level of service and information. They enjoy its ease-of-use and functionality. We are confident that our continued use will result in increased sales opportunities and win rates. 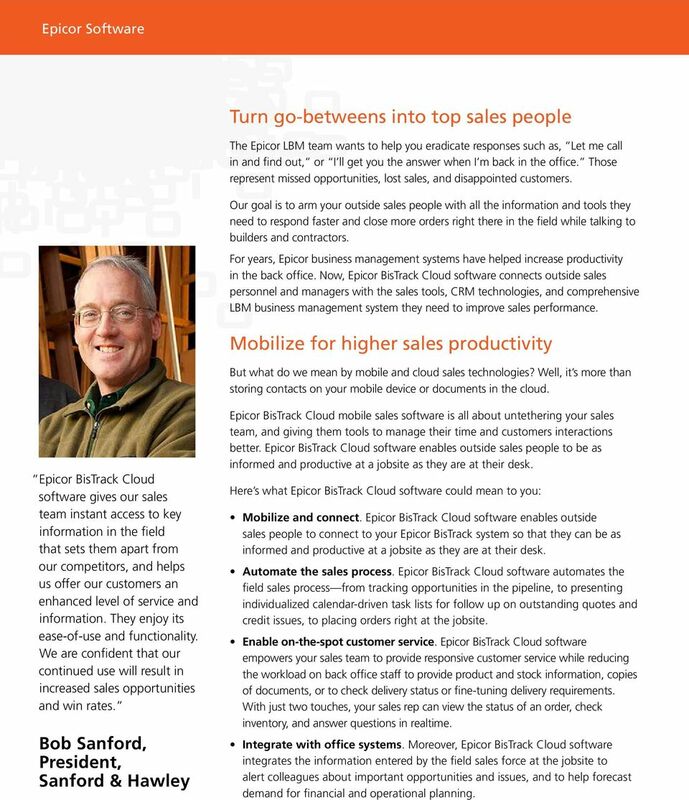 Bob Sanford, President, Sanford & Hawley Epicor BisTrack Cloud mobile sales software is all about untethering your sales team, and giving them tools to manage their time and customers interactions better. Epicor BisTrack Cloud software enables outside sales people to be as informed and productive at a jobsite as they are at their desk. Here s what Epicor BisTrack Cloud software could mean to you: Mobilize and connect. Epicor BisTrack Cloud software enables outside sales people to connect to your Epicor BisTrack system so that they can be as informed and productive at a jobsite as they are at their desk. Automate the sales process. Epicor BisTrack Cloud software automates the field sales process from tracking opportunities in the pipeline, to presenting individualized calendar-driven task lists for follow up on outstanding quotes and credit issues, to placing orders right at the jobsite. Enable on-the-spot customer service. Epicor BisTrack Cloud software empowers your sales team to provide responsive customer service while reducing the workload on back office staff to provide product and stock information, copies of documents, or to check delivery status or fine-tuning delivery requirements. With just two touches, your sales rep can view the status of an order, check inventory, and answer questions in realtime. Integrate with office systems. Moreover, Epicor BisTrack Cloud software integrates the information entered by the field sales force at the jobsite to alert colleagues about important opportunities and issues, and to help forecast demand for financial and operational planning. 3 Yankee Group 1 reported improved sales metrics using mobile enterprise technologies 26% increased win rates 28% increased field selling time 25% increased forecast accuracy 27% eliminated redundant activities 25% reduced sales call costs 24% decreased administrative time Sell more without adding more people Nucleus Research 2 reports that making CRM capabilities available on mobile technologies is effective in driving ROI on CRM investments. In the study, the 74% of CRM users who had adopted mobile technologies reported an average increase in sales productivity of 15%. One third of respondents reported greater than 20% increase in sales productivity. 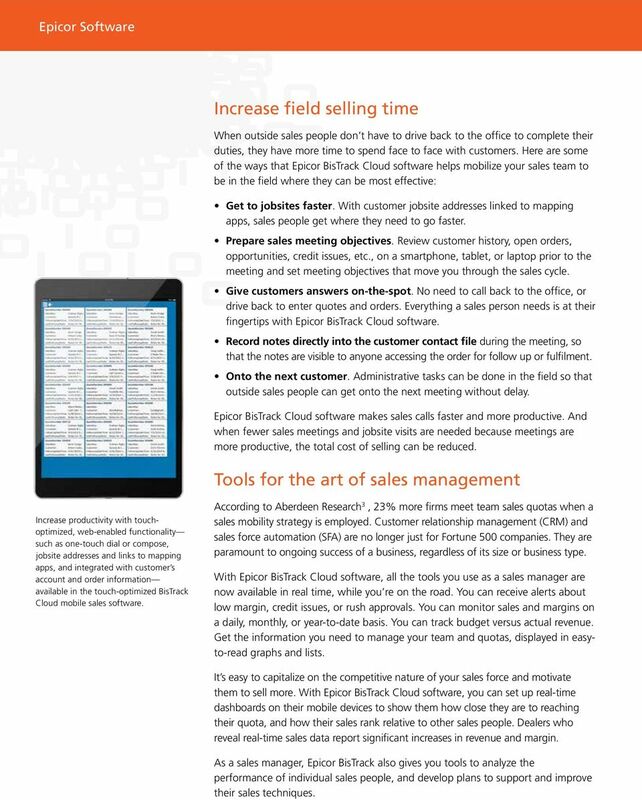 Here are some of the specific ways that Epicor BisTrack Cloud mobile sales software will help your outside sales people be more effective: Followup is a surprisingly simple, yet effective sales process. One Epicor BisTrack customer tripled (tripled!) their quote conversion rate simply by reminding sales people to follow up on outstanding quotes. Provide quick responses. Don t give contractors and builders time to check with your competitors. With access in the field to real-time inventory and product information, pricing that includes any pre-negotiated discounts, ordering history, and much more, your outside sales people can quickly provide the information that allows customers to make decisions on the spot. Track and follow up on opportunities. Use Epicor BisTrack Advanced CRM to follow up on building permits, contractor proposals, and other opportunities so that you don t miss the chance to quote. Generate and quotes from the jobsite. Respond to quote requests on-the-spot and the quotes to get customer approval while you re still there to discuss it. Remind sales people to follow up on quotes. Epicor BisTrack Cloud software can put individualized lists of outstanding quotes and follow up activities at their fingertips no matter where they are. Order product from your mobile device. Create orders on the jobsite, a convenient service for a customer s last-minute needs or quick add-on orders often resulting in incremental pull-through sales. The faster and easier your company is to do business with, the more you ll sell to your best customers. By enabling sales people to connect and be informed, you empower them to achieve their best and be a top performer. 4 Increase field selling time When outside sales people don t have to drive back to the office to complete their duties, they have more time to spend face to face with customers. Here are some of the ways that Epicor BisTrack Cloud software helps mobilize your sales team to be in the field where they can be most effective: Get to jobsites faster. With customer jobsite addresses linked to mapping apps, sales people get where they need to go faster. Prepare sales meeting objectives. Review customer history, open orders, opportunities, credit issues, etc., on a smartphone, tablet, or laptop prior to the meeting and set meeting objectives that move you through the sales cycle. Give customers answers on-the-spot. No need to call back to the office, or drive back to enter quotes and orders. Everything a sales person needs is at their fingertips with Epicor BisTrack Cloud software. Record notes directly into the customer contact file during the meeting, so that the notes are visible to anyone accessing the order for follow up or fulfilment. Onto the next customer. Administrative tasks can be done in the field so that outside sales people can get onto the next meeting without delay. Epicor BisTrack Cloud software makes sales calls faster and more productive. And when fewer sales meetings and jobsite visits are needed because meetings are more productive, the total cost of selling can be reduced. Tools for the art of sales management Increase productivity with touchoptimized, web-enabled functionality such as one-touch dial or compose, jobsite addresses and links to mapping apps, and integrated with customer s account and order information available in the touch-optimized BisTrack Cloud mobile sales software. According to Aberdeen Research 3, 23% more firms meet team sales quotas when a sales mobility strategy is employed. Customer relationship management (CRM) and sales force automation (SFA) are no longer just for Fortune 500 companies. They are paramount to ongoing success of a business, regardless of its size or business type. With Epicor BisTrack Cloud software, all the tools you use as a sales manager are now available in real time, while you re on the road. You can receive alerts about low margin, credit issues, or rush approvals. You can monitor sales and margins on a daily, monthly, or year-to-date basis. You can track budget versus actual revenue. Get the information you need to manage your team and quotas, displayed in easyto-read graphs and lists. It s easy to capitalize on the competitive nature of your sales force and motivate them to sell more. With Epicor BisTrack Cloud software, you can set up real-time dashboards on their mobile devices to show them how close they are to reaching their quota, and how their sales rank relative to other sales people. Dealers who reveal real-time sales data report significant increases in revenue and margin. As a sales manager, Epicor BisTrack also gives you tools to analyze the performance of individual sales people, and develop plans to support and improve their sales techniques. 5 Track opportunity and quote followup. Monitor each sales person s sales pipeline by tracking the number of opportunities and outstanding quotes, as well as followup activity. Track quote conversions, to both wins and losses, broken down by sales person. Categorize wins and losses to better understand where you re successful and develop strategies to improve win rates. Display real-time sales to sales team. Give your team up-to-date sales, margin, and ranking information to spark their competitive spirit and help them manage their own performance. With BisTrack Cloud, sales managers can have a bird s eye view of their sales team s activities and performance. Having business intelligence on the road with you means never losing sight of priorities, issues, and opportunities. 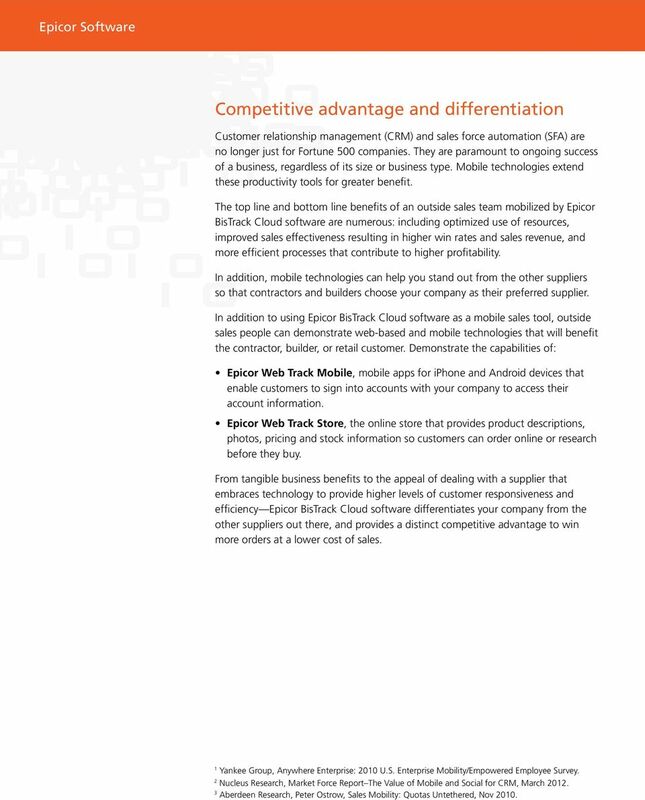 Gain companywide efficiencies When your mobile sales people are connected and integrated with your corporate systems, other functions also benefit from efficiencies and intelligence. Branch sales and administration efficiencies. Your back office and counter staff will be more productive too, because the outside sales team won t have to call in to request information, quotes, and order status. Counter staff have more time for customers coming into your branch locations. BisTrack Cloud mobile sales software enables outside sales people to be connected, informed, and productive on the jobsite and on the road. Support staff can concentrate on order fulfillment instead of continually reacting and getting answers for sales people. Bottlenecks can be eliminated as single sources of information are made available to everyone. Response time and customer service levels can improve for customers both at your branches and at their jobsite. With less redundant data entry and fewer people handling requests for information, everyone works more efficiently. More efficient staffing means you can support growth without adding additional support staff. Improved operations and financial planning from better forecast accuracy. From an operations and financial management point of view, a mobilized and connected sales team can provide insight into upcoming demand to help plan procurement, manufacturing, and requirements for capital and human resources. With mobile devices in hand, it s easier for sales people to update the BisTrack Opportunities module while in a meeting or soon after while it s fresh in their minds, making it easier for sales managers to gauge the probability of success for the opportunities in each sales person s pipeline and relay that information to operations and financial managers. 6 Competitive advantage and differentiation Customer relationship management (CRM) and sales force automation (SFA) are no longer just for Fortune 500 companies. They are paramount to ongoing success of a business, regardless of its size or business type. Mobile technologies extend these productivity tools for greater benefit. 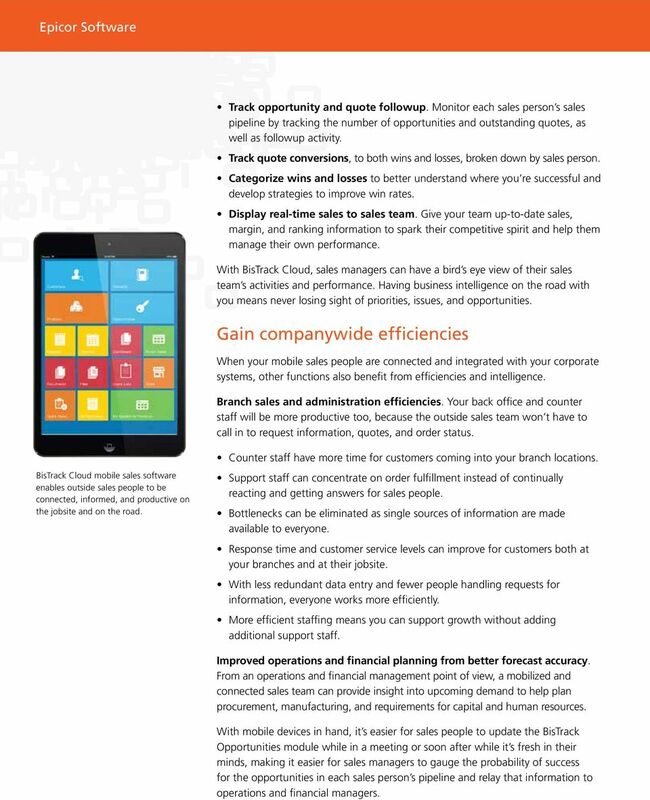 The top line and bottom line benefits of an outside sales team mobilized by Epicor BisTrack Cloud software are numerous: including optimized use of resources, improved sales effectiveness resulting in higher win rates and sales revenue, and more efficient processes that contribute to higher profitability. In addition, mobile technologies can help you stand out from the other suppliers so that contractors and builders choose your company as their preferred supplier. In addition to using Epicor BisTrack Cloud software as a mobile sales tool, outside sales people can demonstrate web-based and mobile technologies that will benefit the contractor, builder, or retail customer. Demonstrate the capabilities of: Epicor Web Track Mobile, mobile apps for iphone and Android devices that enable customers to sign into accounts with your company to access their account information. Epicor Web Track Store, the online store that provides product descriptions, photos, pricing and stock information so customers can order online or research before they buy. From tangible business benefits to the appeal of dealing with a supplier that embraces technology to provide higher levels of customer responsiveness and efficiency Epicor BisTrack Cloud software differentiates your company from the other suppliers out there, and provides a distinct competitive advantage to win more orders at a lower cost of sales. 1 Yankee Group, Anywhere Enterprise: 2010 U.S. Enterprise Mobility/Empowered Employee Survey. 2 Nucleus Research, Market Force Report The Value of Mobile and Social for CRM, March Aberdeen Research, Peter Ostrow, Sales Mobility: Quotas Untethered, Nov 2010. 7 About the LBM Team at Epicor Epicor has served the LBM industry for over 30 years. In that time, over 2,000 lumber and building materials suppliers ranging from home center to pro dealer to distributor have selected Epicor as their software provider. Combined, we estimate that Epicor customers represent 60% of the total North American LBM market. 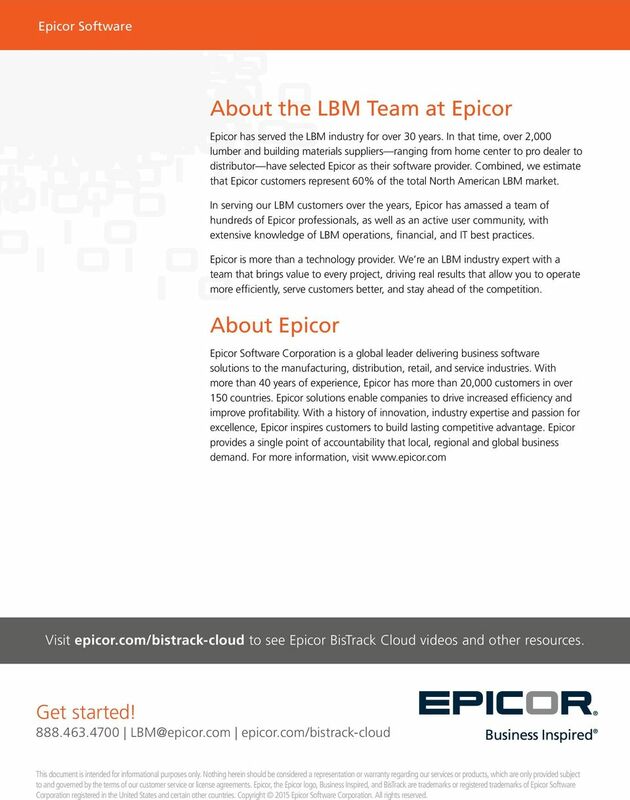 In serving our LBM customers over the years, Epicor has amassed a team of hundreds of Epicor professionals, as well as an active user community, with extensive knowledge of LBM operations, financial, and IT best practices. Epicor is more than a technology provider. We re an LBM industry expert with a team that brings value to every project, driving real results that allow you to operate more efficiently, serve customers better, and stay ahead of the competition. About Epicor Epicor Software Corporation is a global leader delivering business software solutions to the manufacturing, distribution, retail, and service industries. With more than 40 years of experience, Epicor has more than 20,000 customers in over 150 countries. Epicor solutions enable companies to drive increased efficiency and improve profitability. With a history of innovation, industry expertise and passion for excellence, Epicor inspires customers to build lasting competitive advantage. Epicor provides a single point of accountability that local, regional and global business demand. For more information, visit Visit epicor.com/bistrack-cloud to see Epicor BisTrack Cloud videos and other resources. Get started! epicor.com/bistrack-cloud This document is intended for informational purposes only. Nothing herein should be considered a representation or warranty regarding our services or products, which are only provided subject to and governed by the terms of our customer service or license agreements. Epicor, the Epicor logo, Business Inspired, and BisTrack are trademarks or registered trademarks of Epicor Software Corporation registered in the United States and certain other countries. Copyright 2015 Epicor Software Corporation. All rights reserved. Business Intelligence: How better analytics can lead your business to higher profits. 25 Questions Top Performing Sales Teams Can Answer - Can You? Sage 50 Accounts. What is Sage 50 Accounts? What is Sage 50 Accounts? setup and provide drill-down capabilities to view further details on metrics and dynamic updates for a real-time view of your business conditions. Why CRM implementations fail and what to do about it. WennSoft Evolution CONNECTED Business. REMARKABLE Field Service. BlackBerry Business Solutions for Sales Ideal solutions for SALES ON THE GO AND ON THE SPOT. About BlackBerry Business Solutions. BlackBerry Business Solutions are about much more than wireless email. Market-leading accounts software for small to medium sized businesses who need complete control and confidence in their finances.